Enhance your pool house or beach house décor with wonderful reminders of water and fun, or bring the beach or pool to your home if the best you can do is to dream of fun in the sun beside or in the water. Pictures, bed clothing, and signs might not be enough to bring the ocean to you but they can combine to make a place in your home that will bring fond memories or feed the dreams of sand beneath the feet, the beating sun from above, with cool water splashing around ankles as you enter the surf. Often constructed of wood or metal, a sign or a plaque can be a reminder of fun times to be had at the beach. Getting in the water and being completely wet all over on a hot summer day is unparalleled fun for just about anyone. If that isn’t possible, a wall hanging is a fun reminder. Not suitable for outdoors, but an excellent choice for the lobby or room next to a pool, word art on canvas can be very appropriate. The word art can be short messages, safety reminders or rules for games that can be played in the pool. Keep that fun in the sun feeling with you all year long with digitally printed duvet sets that show scenes from the beach. Enjoy the comfort of your climate-controlled bedroom, while looking at a huge mural that shows a lovely ocean scape. Who says you have to endure drab surroundings just because your vacation time doesn’t coincide with the right weather combination for a seaside vacation. Below are ten decorating ideas to enliven your pool house or to express your wishful thinking inside your own home. You can easily enjoy the charm and allure of water without stirring from your own bed if that’s your desire. These items are also suitable to be given as gifts to friends who invite you to share their pool or beach house. 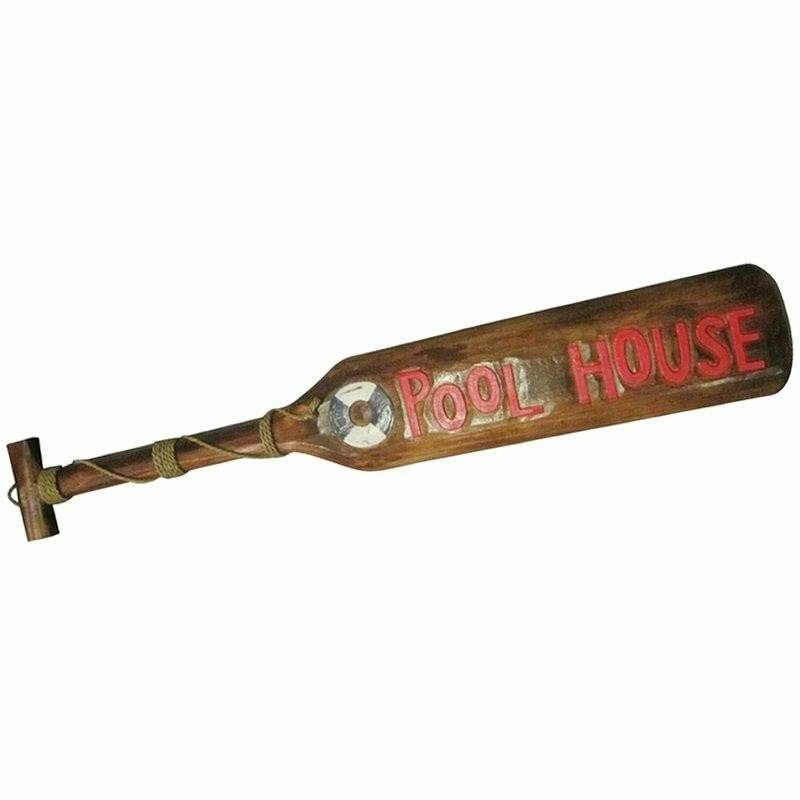 Brighten up the walls of your pool house with this wooden boat paddle emblazoned with the words “Pool House” in bright red. It is a knockout invitation to your pool house and a way to give a nautical air to even the most landlocked swimming pool. Your friends and family are bound to appreciate it. Make the lounge or home area nearest your pool with this light and water dappled graphic art on canvas. The view is from topside down, as if you were looking into your pool from a balcony. An inflated ball and an air mattress complete the picture. If you don’t have a pool, you can use this picture to dream a little. Enjoy super poolside comfort with this outdoor throw pillow with the words “Beach House” appliqued to the front. The zipper cover is machine washable, and the pillow insert is quick drying. Use it in your own beach house, or give it as a host/hostess gift next time you are invited to a friend’s poolside. Make young swimmers or even young non-swimmers happy in the pool with Big Joe Crab, the crab-shaped pool raft. Joe is crafted from mildew and UV resistant mesh and filled with buoyant ultimax foam beads. This means that he is always ready for fun in the pool – no worries about inflating or deflating at crucial moments. Can’t make it to the pool? No worries. Relax on your bed under the air conditioning and enjoy this printed on view of Lake Maggiorre as seen from the balcony of a house with a pool. The duvet cover has a hidden zipper so it can be zipped off and washed without difficulty. Alternatively, this is a lovely set of bedding for your beach house or pool house. Decorate your poolside area with a distressed, vintage look, pool area sign that reads, “Life is better by the Pool.” Space is provided at the top for personalization. With this benign message, your guests are sure to grab their swimwear and head for the water without too many stops in between suitcase and pool. Dress up the wall of your pool house or beach house with the rules for Sharks and Minnows. This text on canvas artwork is not suitable for outdoors, but can readily be displayed on an interior wall near the swimming area. Swimmers of all ages will no doubt have fun with this water-based game of tag. Bring the pool to you if you can’t make it to the pool with this duvet set that seems to be displaying a wooden deck hanging out over sun-dappled water. Digitally printed on one side (the other side is white) machine wash the duvet and pillow sham in cold water, tumble dry on low heat. Do not bleach. Only the covers are included, not the inserts. This eye-catching bronze wall hanging depicts a dense shoal of fish. Perfect for the interior of the room next to your outdoor pool or for the wall of your pool or beach house, these little fish are sure to be a hit. Surround them with other beachside or poolside pictures for added effect. Turn your indoor pool into a simulation of the beach with this large ocean mural. The picture shows a boat dock in the distance, and a horizon viewed across a serene sea. Add a few potted palms and the effect will be complete. If you don’t have a pool area, use it on your living room wall to alleviate the closeness of a city apartment. The picture is so realistic you can practically smell the salt breeze.